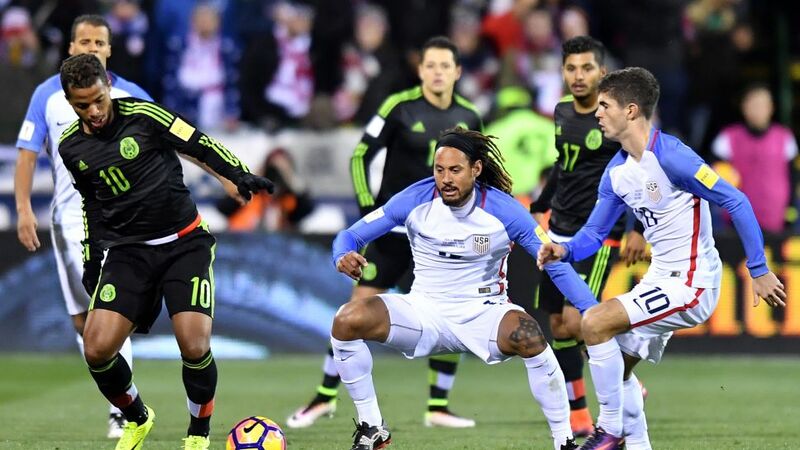 The USA were beaten at home by Mexico on Friday night. Javier 'Chicharito' Hernandez helped Mexico earn a big advantage in the fifth round of CONCACAF zone 2018 FIFA World Cup qualifying as El Tri picked up an invaluable 2-1 win over the USA in Columbus, Ohio. Want Chicharito in your Official Fantasy Bundesliga team? Sign him up now! USMNT coach Jürgen Klinsmann named seven Bundesliga stars in his squad for this match and fielded five of them in his starting line-up, with Fabian Johnson, John Anthony Brooks, Timothy Chandler, Christian Pulisic and Bobby Wood all taking to the field at kick-off. Pulisic was the hosts' liveliest player going forward and had a few decent runs but it was Mexico, led by Bayer 04 Leverkusen striker Chicharito, who had the better of the first half, hitting the woodwork twice and taking the lead through a long-distance strike by Miguel Layun. The USA were much more aggressive early in the second half and shortly after some lovely skill from Pulisic set the Mexico defence on edge, Wood equalised with a well-taken finish, holding off Layun to tuck in from ten yards out. The match was an intensely-fought affair thereafter, with chances at both ends, but ultimately Mexico took all three points when veteran captain Rafael Marquez headed in a late corner to put El Tri in the driving seat in this 'Hexagonal' qualifier. Fabian Johnson of Borussia Mönchengladbach worked tirelessly in the second half. Pulisic was the youngest player on the pitch but also the best. As ever, the 18-year-old Borussia Dortmund starlet was not overawed by the occasion or magnitude of the game and was full of direct running and menace. Make no mistake, this was a huge win for Chicharito and Co. Mexico had not beaten the USA in World Cup qualifying on American soil since 1972 and now head into their next game, away to Panama on Tuesday, full of confidence. This match was played in Columbus, Ohio in the very stadium where Pulisic made his senior debut in March earlier this year.This was the first time Brooks, Chandler and Pulisic faced Mexico at senior international level.Brooks made his first appearance in a FIFA World Cup qualifier in this match, his 28th cap for the USMNT.